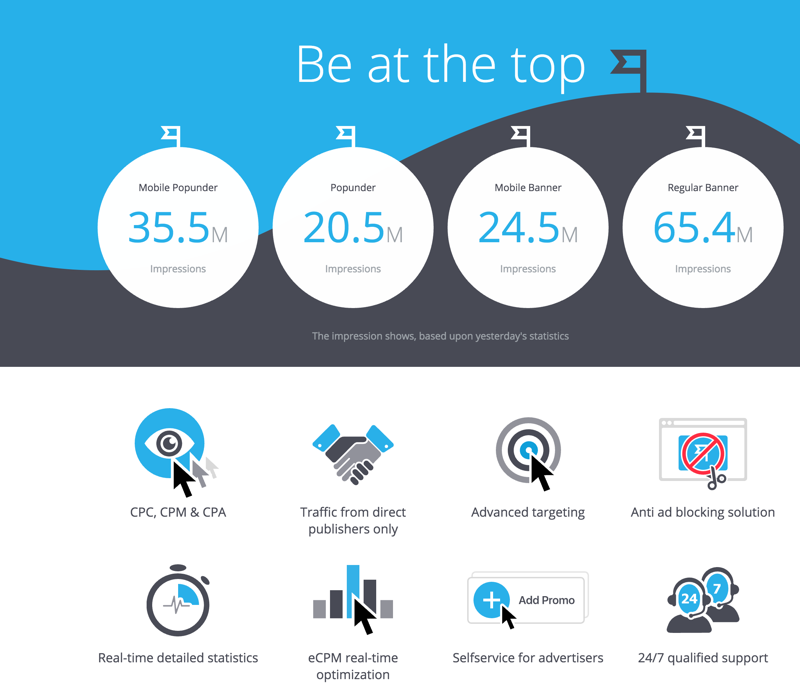 Best CPM Ad Networks For Publisers. Do you have a high-traffic website and are looking to monetize the footer of your website with CPM ads? Here, I have compiled a list of the best CPM ad networks that a publisher like you can join & start earning money. If you are interested in making money through CPM ads, here are the top CPM advertising programs which you can join to make money from your blog. This is a great CPM ad network that you can try in 2017. They offer an ad for all screen types which makes it a popular choice for various webmasters, while multiple payment options make PropellerAds an ideal choice for bloggers around the globe. CPM (cost per thousand impressions) advertisements are a great way to earn income with your blog. CPM advertising pays you according to the amount of impressions received on an advertisement. An “impression” means a single instance of an advertisement appearing on your website. 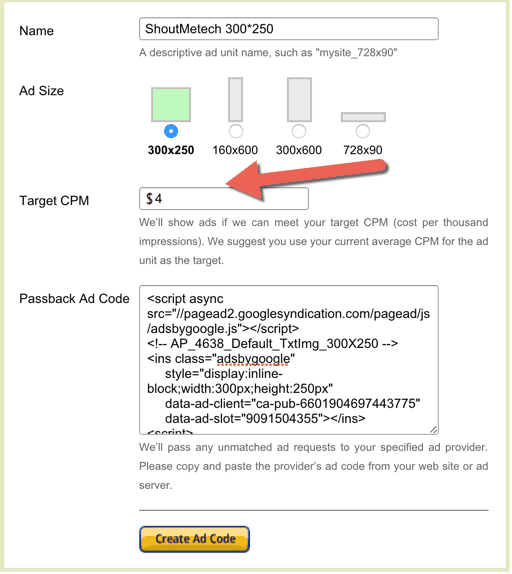 This means that even if your readers are not clicking on your blog’s ads, with CPM ads, you can still get paid. Note: To ensure a better income from CPM ads, be sure to place them inprominent positions on your site. You might find CPM ads very appealing, but they work best for bloggers who get a high volume of traffic. If you are driving traffic in the area of thousands of visitors per day, then you can get a good amount of money from CPM ads. HillTopAds is another great CPC/CPM ad network for webmasters with medium or high-traffic websites. What makes them stand out is their anti-ad blocker technology that ensures you get paid for most of your traffic. The minimum payout is $50, and unlike other ad companies, they don’t charge anything for transaction fees. They offer a wide range of payment options including Payoneer &Bitcoin. The interface is quite modern & easy to use. Getting started is easy & you can submit more than one website to get approval. They offer a wide variety of ad types & it works great if you have a lot of mobile traffic. This is one network you should definitely try. If you are looking for high-quality ads from a CPM-based ad network, then you should try AdBuff. AdBuff offers both CPM & CPC ads, and boasts around a 100% fill rate. To get an approved account, you need to have a quality site with 2000 unique visitors per day. The minimum payout is $100 & the payment modes include PayPal, Payoneer, Bitcoin, and wire transfer. The interface is easy to use & they also have an Android & iOS app. They are one of the few CPM ad networks that offers a mobile app. You can use the app to check how much revenue you are generating. Since they also offer CPC-based ads, you can use the combination of CPM + CPC to increase your revenue even further. ClickADu is a premium pop-under CPM ad network with a great fill rate. You will like ClickADu for their forecast feature which shows you how much money you can earn from the current period. Getting started with ClickADu is easy & approval takes only 24 hours. Note: These are pop-under ads and are not recommended for quality content sites. One thing that caught my attention is the transparency of the platform. Inside the dashboard, you can click on Average CPM & that shows the CPM rate for various geo-locations & device types. This will give you a good idea of what you need to do to earn more from ClickADu ads. The minimum payout is $100. They support multiple payment options like Paxum, Payoneer, E-Payments, Epese, and Webmoney. Wire transfer are also available. Overall, ClickADu is another solid CPM advertisement network for bloggers & publishers. 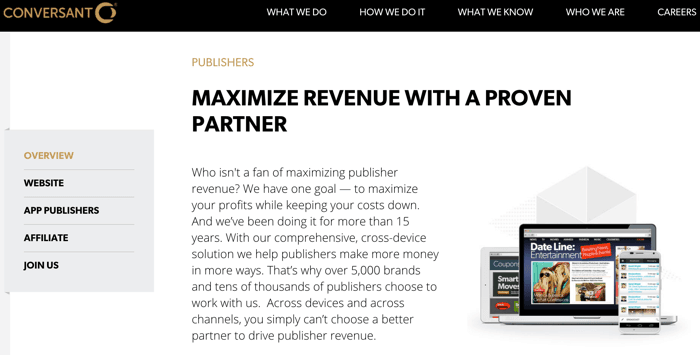 Amazon seems to be coming up with all the possible monetization solutions for publishers. Recently I talked about Amazon Native Ads, and you likely already know about the popular Amazon Associates program. Well, now you have the option of monetizing your blog using Amazon CPM Ads. Right now, Amazon CPM Ads are only for selected Amazon affiliates. If you already have an Amazon Associates account, you can log in to your account to see if you have the Amazon CPM option or not. The first thing you need to do is create your site list. It can consist of just one site, or if you own multiple sites, you can list them too. They also support a “passback” feature, which means if the ads don’t match your minimum CPM guarantee, your fall back ads will display. Currently supported sizes are: 728×90, 160×600, 300×250, and 300×600. Here you can read all the FAQ’s related to Amazon CPM Ads. Conversant is a popular name in the advertising industry. They offer monetization for websites, mobile optimized sites, and also mobile apps. They are the same company behind the popular affiliate network called Commission Junction & they are one of the more reliable CPM-based ad networks. They pay through paper check and PayPal. The downside with Exponential is they require a minimum of 500,000unique users per month. 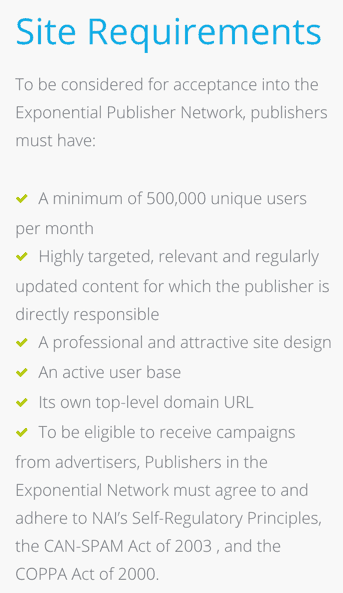 When I checked out their site requirements for publishers, I found it to be very strict for upcoming bloggers. But the great thing about them is the quality of CPM ads. They are one of the best in the advertising industry. They offer high impact ads such as Rising Star ad formats and pre-roll ads with 55% of revenue going to their publishers. Aside from that, their minimum payout is $50 (in net revenue) and payment is Net45. These are just a few CPM advertising networks which I have found worth considering. What other CPM ad networks do you know of & are working great for you? Let us know in the comments section below.